Japan has now passed the 10 gigawatt installed solar power capacity milestone. Only 4 other countries have previously reached 10 gigawatts: Germany, Italy, China, and the United States. China and the U.S. both reached that milestone just this year. Japan is playing catch-up in terms of solar power. Back in 2004, it was the first country in the world to reach 1 gigawatt of cumulative solar power but was overtaken in solar capacity by Germany in 2005. As we’ve previously discussed, the Fukushima nuclear disaster has understandably turned public opinion, and indeed government policy, away from nuclear power towards renewables, especially solar. There is now a solar boom underway Japan. 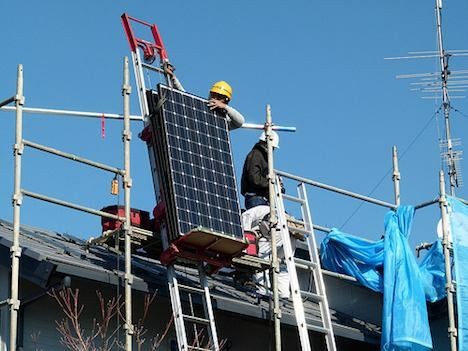 The Japanese government began a feed-in-tariff program to encourage the fast uptake of solar; consequently, solar in Japan grew 270% in the first quarter of this year. Over time, all this growth in solar power happening around the world could lead quite quickly to a significant percentage of renewable energy overall. Just how much is up for debate. As solar finance company Mosaic points out, even the projections from the historically fossil fuel-leanig International Energy Agency (IEA) estimate that renewables will make up 35% of global energy output by 2035. However, in the past the IEA has grossly underestimated the rise of renewables, projecting in 1995 that they would account for only 2% of energy output by 2010. The figure in 2010 was about 20% of electricity production. Sometimes it seems difficult to imagine but at this rate, by 2035 the majority of electricity production in the world could come from renewables, and (cheap) solar power could have a lot to do with that.